First, Cody Garbrandt said he wanted to fight T.J. Dillashaw. Then, the new UFC bantamweight champion said a rematch with Dominick Cruz was the best route. Later still, the Team Alpha Male fighter angled for matchups with featherweight title claimant Jose Aldo and lightweight champion Conor McGregor, and went so far as to say Dillashaw doesn’t draw pay-per-view buys. This seeming constant change of plans has led Dillashaw, the former UFC bantamweight champ, to believe the Garbrandt doesn’t really want to fight him. Indeed, UFC 207 was a ground-shifting night in the men’s 135-pound class. 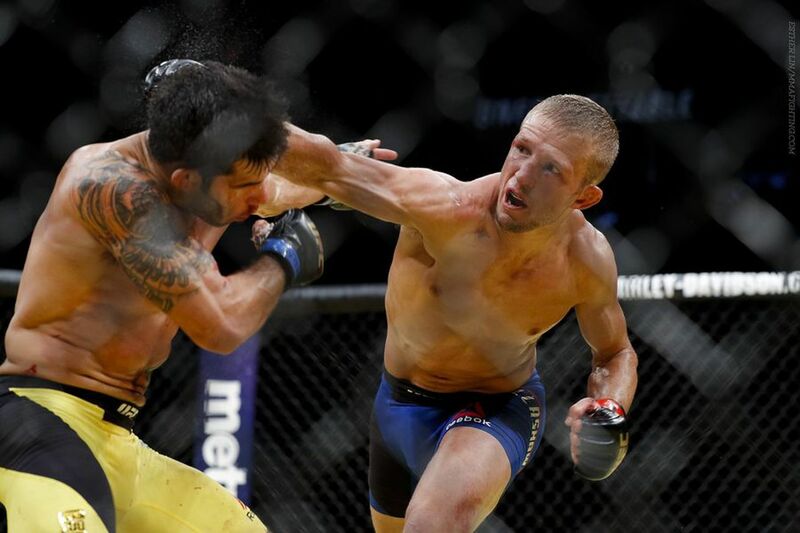 First, Dillashaw, who lost the title in a tight decision after five memorable rounds with Cruz back in January, stated his case with a thorough beatdown of John Lineker for his second straight win since losing the belt. Afterwards, it was revealed Lineker suffered a broken jaw early in the fight, but still went the distance, to which Dillashaw could only shake his head in an odd sense of admiration. Afterwards, he delivered one of the more memorable postfight interviews of the year, laying out his case for what he believed would be a rematch with Cruz, saying the game would be “rigged” if he didn’t get the next title shot. Of course, Cruz then went out and lost to Garbrandt, who has been the most outspoken among Team Alpha Male fighters about Dillashaw’s departure from the gym. And while Dillashaw doesn’t exactly consider Garbrandt his best friend, he’s willing to give him credit for his performance at UFC 207. Since then, Garbrandt hasn’t exactly returned the favor, as he’s come out and said he can’t make any money fighting Dillashaw. But Dillashaw doesn’t think it’s about the cash. Just don’t expect him to do a song and dance to get the shot. Demetrious Johnson lukewarm on Joseph Benavidez trilogy fight: ‘Is it going to sell?